Globalstar uses a network of 48 low earth orbit satellites to offer a high quality voice and data service, coupled with low airtime and hardware costs. The Globalstar second-generation constellation will consist of 32 Low Earth Orbiting (LEO) satellites, manufactured by Thales Alenia Space. 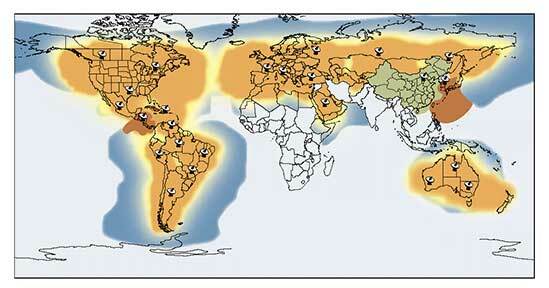 In October 2010 Globalstar began to launch this second-generation satellite constellation designed to restore its commercial voice and duplex data services. With this re-launch, customers can expect a progressive return to high reliability and service quality. Coverage is not global, but includes main European and Med land and waters, an almost complete Atlantic crossing from the US back to Europe and coverage of the Caribbean waters and mainland America. Note that covers very little of the Atlantic crossing from Europe over to the Caribbean and even the Canary Islands are right on the practical limits of the coverage area. Fixed installation equipment is also available. The GSP 1700 handheld satellite phone, Globalstar's latest release. 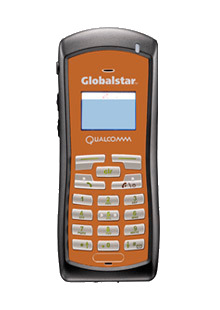 Globalstar offer cheaper and smaller handsets than most of the other satellite networks, and call costs are from 45p per minute. This makes them ideal for emergency usage. If you are restricted to coastal waters and don't need extensive offshore or global coverage, then Globalstar offers somewhat higher quality calls than Iridium and cheaper handsets. Computer data speeds are also higher and the price per minute is lower. Just beware that Globalstar are still suffering some coverage problems with their satellite constellation, and whilst it offers excellent value for money, please talk openly about limitations and ensure it meets your requirements.